A traditional Ayurvedic eye treatment to enhance eye sight, counter fatigue and heaviness in the eyes dry eyes & slow retinal deterioration. The Therapist prepares dough from special grains which is shaped into a small ring and placed over the eyes. This is then filled with warm ghee, either a plain or medicated variety. The ghee is retained within the ring at a specific temperature for a specific time. 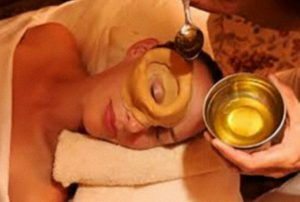 Once the ghee is removed the therapist will massage specific marma points around the affected area. How often should you have a treatment? The treatment is best done over a series of 5 – 10 sessions. Darkness in front of the eyes. Diseases of the eye due to vitiation of vata and pitta Squint. Falling of the eye lashes. Difficulty in opening and closing eyes.